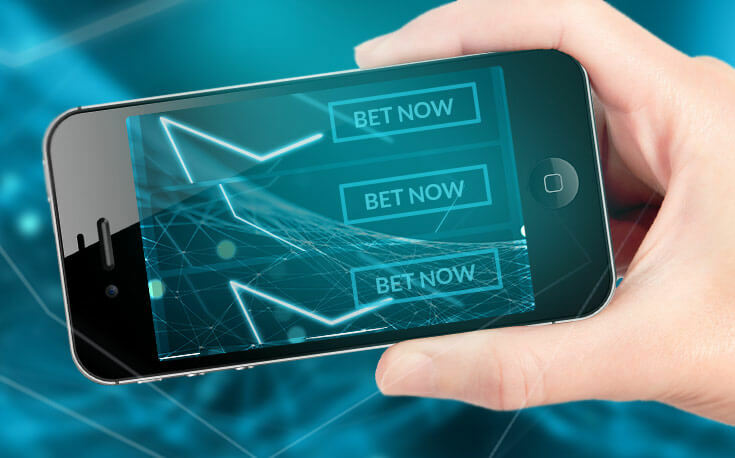 It’s a little misleading to say that mobile sports betting is the way of the future because statistics show that mobile betting is also the way of the present. Estimates are that mobile phone betting comprises nearly half of the total online betting market and it’s set to grow in the coming years. Below we’ll share all the helpful information about the differences between mobile and desktop, how to make a solid mobile sports bet, and detail the biggest frustrations and hurdles we’ve encountered when betting on the go. What Is Mobile Sports Betting? Online betting sites recognize the trend towards smartphones and tablets and have responded accordingly. These days, all of the internet’s top sportsbooks have mobile online betting options. Some sites have developed online betting apps while others focus their efforts on mobile versions of their websites. No matter which site you choose, one thing is certain: whether you’re watching a game at the bar or on the go, you need to be able to place all the bets you want from your phone. How Is Mobile Betting Different than Betting on a Desktop? The term “mobile betting” simply refers to betting on a mobile device, be it a smartphone or tablet. Apart from that, it’s exactly the same as ordinary sports betting (at least when it comes to the types of bets and the odds you’ll encounter). The differences between mobile online betting and desktop betting all relate to the wagering process and the visuals. Since phones have smaller screens than desktops and laptops, sportsbooks can’t fit all the same icons and graphics into the same space. The two images below (Figures 1 and 2) show the difference between Bovada’s football section on desktop versus mobile. Figure 1: Bovada’s desktop football section. Figure 2: Bovada’s mobile football section. Figure 3: Bovada’s football section on mobile with a wager selected. Figure 4: Bovada’s mobile bet slip. Figure 5: Bovada’s mobile bet slip with multiple wagers. What Are the Best Mobile Betting Apps? Which Sportsbooks Have the Best Mobile Sites? Most other major sportsbooks eschew online betting apps in favor of mobile sites. BetOnline and MyBookie.ag are two extremely popular sites with excellent mobile products. The images below contrast what you’ll see on their full sites (compared to their mobile sports betting sites). Figure 6: BetOnline’s desktop sportsbook frontpage. Figure 7: BetOnline’s mobile sportsbook frontpage. Scroll down to find additional sports. From here, you can find the particular game or event you’d like to bet on by selecting the corresponding sport. Figure 8: BetOnline’s mobile bet slip. Once you have selected your desired wager, this screen will pop-up. All that’s left to do is enter the wager amount by clicking “Place My Bet” then “Confirm” the wager. Figure 9: MyBookie’s desktop sportsbook frontpage. 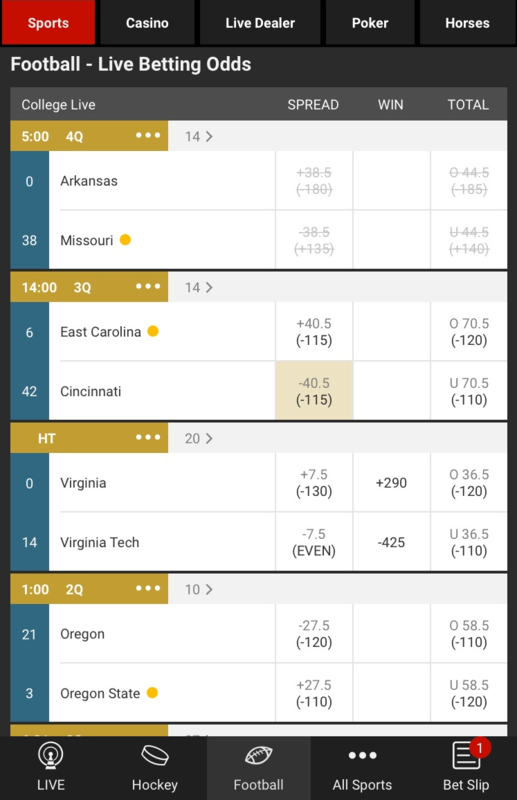 Figure 10: MyBookie’s mobile sportsbook frontpage. Figure 11: MyBookie’s mobile bet slip. How Do You Place Bets on a Mobile Device? Incidentally, with the Bovada screenshots above (Figures 1 to 5), I’ve already walked you through most of the process of placing a bet on a mobile device, but let’s review and finish the job. Log into your preferred account (either on the mobile site or mobile app). Click on the sport you want to bet on. Click on the game you want to bet on. Navigate to the site’s “Bet Slip”. Mobile betting isn’t totally equivalent to betting on your desktop, and it does have a few select issues. The biggest frustration with mobile betting relates to viewing lines/odds. Depending on which mobile sports betting or online betting app you’re using, you may have to navigate to different pages in order to see the spread, the moneyline, and total for the same game. When looking at the odds for, say, an NFL game, you want to know the full slate of wagers that are available. Betting on the spread often depends on the total for that game. Most sharps are less eager to lay a lot of points in a game with a low total. Secondly, you often want to create parlays with the spread, moneyline, and/or total, and it’s much more efficient if you can do so from one page. The frustration boils down to wanting all of the information at once and being able to do as much as possible on a single page. Mobile betting is not well-suited to meet those needs. This limitation is just a reality of viewing sportsbooks on a small screen. Not all the information will fit onto one page. Generally, mobile sports betting sites have done their best to create a user-friendly interface, but there’s only so much that can be done. When you’re betting on your phone, you might be betting on a game that’s in progress. One of the keys to successful in-play betting is having up-to-the-second information on the status of the game. Getting this information can create login issues. When it comes to live betting football, for instance, almost every sportsbook indicates which team has the ball (usually with a little dot next to that team’s name). In a sport with as few possessions as football, a team’s win percentage can change significantly based on the down and distance of the current drive. If you were to navigate between multiple apps then go back to your mobile sportbook, you’re usually logged out because you’ve been away for too long. You’ll have to sign back in to get to your game to enter your wager. It isn’t that difficult, but when it happens repeatedly, it is a huge pain. It can also lead to missing out on the best odds, especially when lines change very quickly. Pro-tip for iPhone users: The password manager helps speed up the process without having to use the “Remember Me” feature on sign-in pages (which carry certain security risks). By clicking on the password field, your iPhone automatically asks if you want to enter the saved password for that site. Lately, we’ve noticed an increase in mobile use vs. desktop. Mobile betting sites and mobile betting apps have become more than just serviceable substitutes reserved for a commute. It’s often easier to relax on the couch, phone in hand while watching a game rather than getting up and using your computer. If you haven’t started mobile sports betting yet, you’re missing out on some prime lounging time. If you haven’t started betting yet, you can brush up on the fundamentals with our Sports Betting 101 guide.